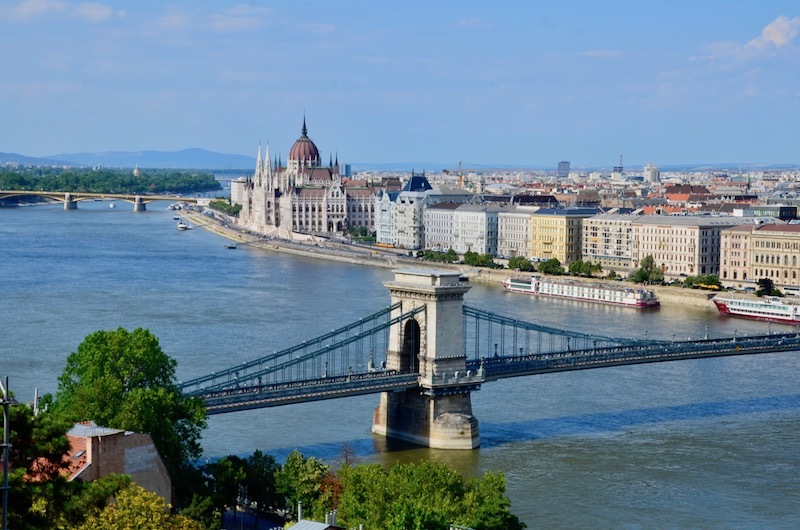 Hungary’s capital city Budapest is actually made up of 3 unified cities, with Buda and Óbuda on the west bank of the Danube and Pest on the east bank. Much of the city has been granted UNESCO World Heritage Site status, and many visitors consider the city to be amongst the most beautiful cities in Europe. TIP: Consider the Budapest City Card for free entrance to museums, a guided tour, discounts and unlimited use of public transport. Parliament Building – was designed and built in the Gothic Revival style, is one of the largest buildings in Hungary, and is home to hundreds of parliamentary offices. Although the impressive building looks fantastic from every angle, to see the whole building in its full glory, it is worth viewing it from the other side of the Danube. Tours of certain areas of the building are available daily, and run in different languages. You will need identification to get in, and your bag may be searched on entry. Gellért Baths – One of the grandest spas in the city is the Gellert Bath and Spa centre, which includes an open-air pool (which turns into a wave pool), an effervescent swimming pool, a Finnish sauna, and a range of other saunas and plunge pools. Massages and other spa treatments are also available at an extra fee. The complex was originally built between 1912 and 1918 in an Art Nouveau style, but it sustained serious damage during World War II. The whole spa was extensively renovated in 2008 to bring the baths back to their former glory. The baths are open all week for mixed bathing. Heroes’ Square – marks the end of Andrássy Avenue is home to an iconic monument which features depictions of the Seven Chieftains of the Magyars, who are believed to have led the Hungarian people from central Asia to the Carpathian basin. Atop the central pillar is the Archangel Gabriel, who is holding the Hungarian crown. At either side of the central column are two matching colonnades, which depict a variety of other historical Hungarian figures. The impressive buildings at either side of the square are art galleries. Margaret Island – 2.5km long island which sits in the middle of the Danube, which is covered in parkland and recreational facilities. There are a number of companies which rent pedal carts, golf carts, and other self-powered vehicles, so that you can explore the island properly. A rubber-coated 5.5 km running track encircles the island, and is a popular jogging spot for runners who want to get away from the hustle and bustle of the city. One of the most famous features of the island is the “music fountain”, from which water regularly “dances” in time to classical music. Other notable features on the island include medieval ruins and small aviary which primarily caters for injured water birds and wildfowl. Danube Promenade – This stretch of the Danube walkway goes from the Elizabeth Bridge to the Chain Bridge, and is perfect for those who want a short, but interesting walk. Promenading along the Danube is a great way to see many of the most famous sights in the capital. Looking over towards to Buda side of the river, you will see the Buda Castle, the Liberty Statue on Gellert Hill and the Fisherman’s Bastion. On the Promenade side of the river you can enjoy restaurants, cafes, Szechenyi Istvan Square and a range of different sculptures, including the Little Princess. The Danube is also perfect for a river cruise, there’s a fun dinner cruise and folk show (with gypsy music) which you can book here. House of Terror – The House of Terror holds exhibitions about the successive Fascist and Communist regimes which ruled Hungary during the 20th Century. The building itself was the former headquarters of the Fascist Arrow Cross party, and the building was subsequently used as a prison and torture venue by the State Security services of Hungary. There is the opportunity to tour some of the prison area in the basement. The exhibition includes information about both regimes, as well as testimonials from some of the victims and temporary exhibits. St. Stephen’s Basilica – This basilica is one of the most important religious buildings in Hungary, and visitors to the reliquary can see the (reported) right hand of Stephen, first King of Hungary. As this is a holy site, visitors who plan on entering the church are asked to keep their knees and shoulders covered. Those with a head for heights can travel up to the base of the dome and look out over the city. On a clear day, this is a great vantage point from which to survey Budapest from the air. Classical music concerts and organ concerts regularly take place inside the Basilica, and sometime spill out into the square outside. Hungarian State Opera House – This Neo-Renaissance building was first opened in 1884, following a commission from Emperor Franz Joseph. Outside of the building, you can see statues to Ferenc Erkel (composer of the Hungarian National Anthem) and Ferenc Liszt (Hungarian composer). The 1200 seat auditorium is considered to be one of the best in the world for operatic performances, and it is well worth it to buy a ticket to a show. Fisherman’s Bastion – Although the Fisherman’s Bastion looks like a medieval monument, it was actually built in the early 20th century in a neo-Gothic style, specifically to act as a panoramic viewing platform across the Danube, Margaret Island and Pest. It is named after the Guild of Fishermen, which was responsible for defending that stretch of the city walls during the Middle Ages. The seven towers of the Bastion represent the seven Magyar tribes that helped to settle the Magyar people in the Carpathian Basin. Come at sunset to see a particularly beautiful view of the city. Invisible Exhibition – aims to give visitors the chance to experience what life is like for people who are completely blind. A registered blind guide will take you on a tour through various different artificially created environments (garden, supermarket, bar etc) which are in completely dark rooms. On arrival, you will be asked to turn off any potential light sources, such as mobile phones or digital watches, so that there will no light at all in the rooms. After the exhibition, you can enjoy dinner in the dark, served by blind waiters, who will help you to find your way around your dinner plate. Faust Wine Cellars – This historic wine cellar, which is located underneath the Buda Castle is the perfect place to sample wines from some of the 22 Hungarian wine regions. You will also have the opportunity to sample traditional Hungarian fruit palinka. A sommelier will give you tasting notes during your visit, so that you can get the most out of each wine that you try. There are a range of different tasting programes available. Memento Park – This wonderful sculpture park is now home to some of the many Communist monuments and statues which dotted the city during the Communist Era. These statues were either removed by the government as part of the decommunization process, or they were forcibly removed by the Hungarian people in protest at the previous regime. When the park was opened in 1993, it became a place to display some of these monuments and showcase an important part of the city’s history. A small museum on site also includes temporary exhibitions about life under the communist regime, including information about the Hungarian Secret Police. Dohány Street Synagogue is currently one of the largest in the world outside of Israel, despite the fact that Hungary’s Jewish population was significantly depleted during World War II. The interior and the garden were restored in the 1990’s, with much of the funding coming from the Hungarian Jewish diaspora population worldwide. In the garden you can see a weeping willow memorial, whose metal leaves bear the names of some of those killed during the war. There is also a memorial to Swedish diplomat Roual Wallenberg, who helped to save hundreds of Hungarian Jews from concentration camps and ghettos. Ecseri Flea Market – fantastic flea market on the outskirts of the city is a great place to find a bargain. It is possible to pick up a variety of different treasures from here, although you may have to search through stalls full of things that you consider to be trash in order to find them. Even if you are not planning on buying anything, it is still possible to wander for hours amid the stalls, dreaming about the past owners of all of this bric-a-brac. Stalls sell everything from retro clothing, through to memorabilia from the Communist era. Haggling is recommended. Ruin Pubs – Budapest is famous for its “ruin pubs”, in which shabby-chic is the order of the day. The best ruin pubs are set up in sprawling, deserted buildings, which have been filled with comfortable, but slightly worn out furniture. Each pub has its own unique style, so you will often find visitors referring to their favourite pub as “the one with the…”. Popular ruin pubs include Instant (“the one with the crazy animal pictures”), Fogas Ház (“the one with the teeth), Kuplung (“the one with the whale”) and Szimpla. Central Market Hall – Budapest’s most famous marketplace. Whilst many locals still use the market hall as a place to buy their groceries, the market is incredibly popular with the tourists. Locally grown fruits and veg, and locally sourced meats are found on the lower floors, and souvenirs including lace, chess sets and leather goods are available in the upper floors. As well as individual ingredients, it is possible to pick up homemade local delicacies like goulash and langos from the food stall upstairs. Buda Castle Hill Funicular – first opened in 1870, is the second oldest funicular of its kind in the world. A system of weights and counterweights is used to help to raise the carriages up and down the hill. The funicular is the fastest way to get to the top of Castle Hill, and is exceedingly popular because of its panoramic views out across the Danube. The speed of ascent was actually slowed down as of 1988, to give passengers more time to enjoy their ride. The track is open daily until 10pm, so it is also a great way to enjoy views of Pest at night. The Buda Hills – The Buda Hills are one of the greenest areas of the city, and are very popular with Budapest citizens who want to take a little time away from city life. There are various hiking trails to follow and mountain bike paths as well, which range from easy to medium level of difficulty. For those who want to explore the hills in a more leisurely fashion, visit the Children’s Railway, which is entirely staffed by children aged 10-14 (with the exception of some adult staff who are responsible for safety). There are plenty of picnic spots dotted around. Andrássy Avenue – This wonderful boulevard takes visitors from Erzsébet Square in central Pest, out to the City Park, was declared a World Heritage Site in 2002. Taking a walk down Andrássy is a great way to see a number of Budapest’s different architectural styles, including the Hungarian National Opera House, neo-renaissance townhouses and mansions, and a number of different national embassies. The metro line which runs underneath the Avenue is the third oldest underground railway in the world. Liberty Statue – The Liberty Statue on Gellert Hill is one of the few prominent Communist statues which remained in situ after the transition to democracy, in part because of its iconic location overlooking the city. The statue was first erected in 1947 to commemorate the Soviet troops who lost their lives liberating the country, however the engraving was later changed so that it commemorated “all who sacrificed their lives for the independence, freedom, and prosperity of Hungary”. The panoramic views from underneath the statue are unparalleled, and help to make the walk to the top of the hill well worth it. Citadella – sits atop Gellert Hill, was constructed by the Hapsburgs following the failed Hungarian War of Independence. It was thought that its prime strategic position would make it easy to control both Buda and Pest, should any future uprisings occur. Troops were stationed at the Citadel until 1897. Soviet forces once again used the fortress to control the city during the 1956 Hungarian Revolution, and tanks which were situated there fired down on the city. Széchenyi Thermal Baths is the largest “medicinal” bath centre in Europe. The waters are rich in sulphates, calcium, magnesium, bicarbonate and fluoride, which are believed to help patients with degenerative joint illnesses and other medical issues. For those who just want to enjoy the relaxing powers of the thermal pools, there are a variety of different thermal pools on site, as well as saunas and steam rooms. Massages and beauty treatments are also available at an additional fee. The two outdoor pools are fantastic places to visit on a cold, dark night, as the steam rising from the hot water makes the whole place seem wonderfully mysterious. City Park is a wonderful leisure facility for the citizens of Budapest, and includes sports facilities, swimming baths, and a boating lake. During the winter months, the boating lake is transformed into one of Europe’s largest ice rinks. The park is also home to the Budapest Municipal Zoo and Botanical Gardens, the Budapest Circus and the Vajdahunyad Castle (housing the Museum of Hungarian Agriculture). Just outside of the park you can find the Time Wheel, which is one of the largest sand timers in the world. In this sand timer, all of the grains of glass take 1 year to fall from the top section to the bottom, and the timer is rotated every New Year. The Hungarian National Museum is home to thousands of exhibits detailing the history, art, religion and archaeology of the country, including exhibitions from areas which are now considered to be outside of Hungary’s borders. The spectacular Neoclassical museum building itself is worth looking at, even if you do not plan on touring. The peaceful gardens outside of the museum are considered to be a popular meeting spot, and are particularly popular during the summer months. Aquincum Museum and Ruin Garden – This is a great chance to explore some of Hungary’s ancient history. Aquincum was a Roman city which stood where Budapest stands today, and served as an important military base in the ancient Roman Empire. It is possible to walk around some of the ruins, including those of an ancient gladiatorial amphitheatre, and other structures, such as the city bathhouse. In the museum itself, you can view various Roman relics, and a working replica of famous water organ which was discovered in the area in 1931.